The lawsuit in which this Opening Brief was filed is based on the June 28, 2016, decision by the State Lands Commission to renew land leases that will allow Diablo Canyon to continue operating through 2025. The Academy – a nonprofit organization advocating for the public welfare since 1984 ̶ contends that the State Lands Commission did not have the legal authority to exempt Diablo Canyon from environmental review under the California Environmental Quality Act (CEQA), and that its action in doing so was arbitrary and capricious. The Academy’s Opening Brief argues that substantial harm to adjacent communities and the marine ecosystem will occur during the nine-year interval leading up to the plant’s proposed closure in 2025, and that the Court should therefore order the Commission to void the new lease allowing Diablo Canyon to operate until 2025 and to proceed immediately to prepare an Environmental Impact Report, as required under CEQA, to formally review these issues. 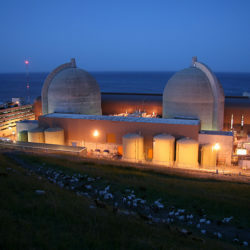 In its Opening Brief, the Academy argues that the following unusual circumstances should be considered as part of a CEQA environmental review: extraordinary seismic risk; adverse health impacts from continuing emissions of radioactive isotopes; devastating impacts on marine life; potential adverse impacts from a terrorist attack; leakage and buildup of radioactive waste; and Diablo Canyon’s status as the sole remaining nuclear power plant in the State of California. The Academy’s Opening Brief begins, on page 1, with the following statement: “On December 18, 2015, Lieutenant Governor (“Lt. Gov.”) Gavin Newsom, was one of three members of the State Lands Commission (“Commission”) holding a public hearing regarding the renewal of two separate existing leases for the use of state land where the Diablo Canyon Nuclear Power Plant (“Diablo”) situated its cooling water discharge channel, water intake structure, breakwaters, and associated infrastructure. These existing leases were scheduled to expire, respectively, on August 27, 2018, and May 31, 2019. Pacific Gas & Electric Company (“PG&E”), owner of the plant, sought a new lease, to run co-terminously with the Nuclear Regulatory Commission (“NRC”) revised operating licenses for the onshore facility, which were set to expire on November 24, 2024 (Unit 1) and August 26, 2025 (Unit 2). The issue before the Commission was whether or not PG&E, whose initial leases were granted more than a decade prior to the enactment of the California Environmental Quality Act (“CEQA”), was entitled to an exemption from the requirements of CEQA in connection with the Commission’s issuance of that new lease. At that December 18 hearing, on open record, the Lieutenant Governor stated his opinion that there is no exemption from CEQA for Diablo. He likened it to the offshore oil derricks that are not exempt from CEQA when their leases are renewed. His initial legal assessment was correct under prevailing law.